Painting in encaustics, which is an ancient, artistic medium, is my newest creative passion. I feel as if am participating in mystical alchemy through the process of heating, melting, adding, fusing and peeling away hot, brilliant color. The process takes over my consciousness, and I imagine myself on an archeological dig, diving deep into the realm of the archetypes. I am lost in an ancient journey of discovery, carving and digging for patterns and imaginal motifs. My encaustic pieces remind me of ancient encrusted treasures, with each work becoming a sacred artifacts. 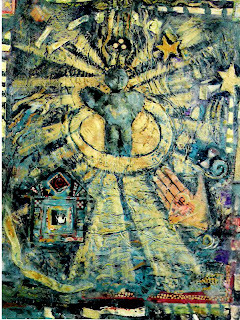 This process allows me to participate in a deeply physical way, with an ancient artistry and seems to naturally bring forth images of healing and myth. Here are some of my encaustic paintings.. This encaustic is not finished, still in process. so the following are photos of each step...(almost)...so that is what follows.. The first images are my stopping place for the day....more to come... more possibilites ...still not complete. This collage ( which I created several years ago) often acts as a guide and reminder for me to be open and accept what is, as well as to look for the guidance available right in front of me. or anything else that is up for us in the moment. One of my students requested I copy it and bring it into class this week...so I decided to post it here. This is something we all have to re remind ourselves of daily. How would this shape your choices about how to spend to day? WHAT IF it doesn’t matter what you do but how you do whatever you do? HOW WOULD this change what you choose to do with you life? WHAT IF you could be more fully present and open-hearted working as a cashier in the corner store - able to really see and be with the people who come into the store – than you are when you are striving to do what you hope or think will make a more important contributions to the world and the lives of those you love? HOW WOULD this change how you want to spend your precious time on this earth.? WHAT IF your contribution to the world and the fulfillment of your own happiness is not dependent upon discovering a better method of prayer of technique of meditation, not dependent upon reading the right book or attending the right seminar, but upon relly seeing and deeply appreciating yourself and the world as they are right now? WHAT IF who you essentially are right now is all that you are even going to be? WHAT IF the question is not why am I so infrequently the person I really want to be , but why do I so infrequently want to be the person I really am? HOW WOULD this change what you have to learn? WHAT IF becoming who and what we really are happens not through striving and trying but by recognizing and receiving the people and places and practices that offer us the warmth of encouragement we need to unfold? HOW WOULD this shape your choices about how to spend today? Recently I have been placing my attention on the positive, regarding some personal, life challenges. This process has made me realize how my on-going involvement with the mandala process has deeply influenced me. So, I am posting some of my images as well as ones created at Illuminated Mandala Retreats that Patricia Waters (art therapist and my co-partner at the Creative Arts Studio) have facilitated at past mandala retreat days. 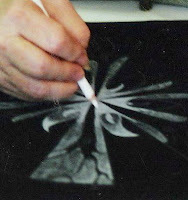 By drawing on black paper with white prismacolor pencils and using the pencil as a light orb, directly connected to the light within the heart space, we transform traditional shading into a powerful, dynamic metaphorical process for drawing the light from within. This amazingly simple art process allows us to manifest an image of the creative life force directly in front of our eyes, on the richness of the deep, black space of our unconscious...represented by the paper. Both myself and Patricia my partner at the Creative Arts Studio are facilitators of the Mandala process developed by Judith Cornell. Mandalas are up for me as I rework and frame a few to take into the gallery in Healdsburg Ca where I show and sell some of my work. ART & ALL THAT JAZZ. I recently faciliated a Mandala retreat with my art therapist friend and partner in the Creative Arts Studio .... so I am back to the lovely, meditative process of working with prismacolors again and finding comfort in mandala making. 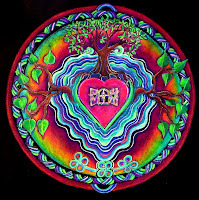 Here are a few of my Heart Mandalas... for a pre Valentines Day inspiration. Want to make one? Draw a circle on paper, find the center, draw/paint/collage a shape, or image in the center and then work out to the edges of the circle thinking of balance and symmetry. Remember to put only images that you want to draw attention to in the center.. postive, uplifting..healing visions! check out my etsy site (www.soularteeclectica.esty.com ) or get in touch with me here. This watercolor is a favorite of mine. I did it many years ago when I gave myself a task of doing a watercolor a day and not letting my inner critic stop me in any way. No matter what it looked like initially, I gave myself over to taking each painting to an esthetic resolution that appealed to me. "She Who Lets the Images go Freely " fits the intention I have loosely set for this blog. I hope to post images on a regular basis as well as promote my personal art, as well as my classes and retreats as an art therapist and my various web sites.